The financial services industry is in the early stages of a significant digital transformation. With investment in fintech rising from $520 million in 2010 to about $3 billion in 2014, the financial services industry is well funded to drive unprecedented change. Historically on opposite sides of the playing field, smart fintech firms and financial institutions are beginning to see that they need one another to thrive. 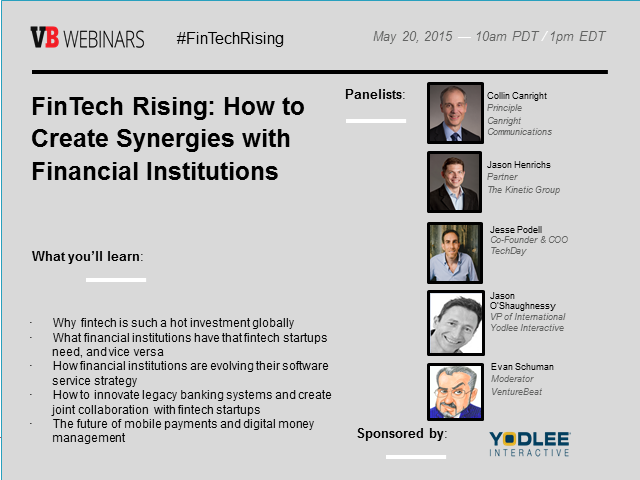 Join Yodlee® Interactive for a webinar hosted by VentureBeat on May 20th at 10 a.m. PT, for engaging commentary and analysis about the evolution of the financial services model and how banks and fintech companies can work together through joint innovation. Hear from panelists Collin Canright, Principal at Canright Communications, Jason Henrichs, Partner at The Kenetic Group, Jesse Podell, Co-Founder and COO at TechDay and Jason O’Shaughnessey, VP of International at Yodlee Interactive.